This provisional board, led by Pastor Henry Cher-aime, is tasked with beginning an alliance of Grace Brethren congregations in the Bahamas. 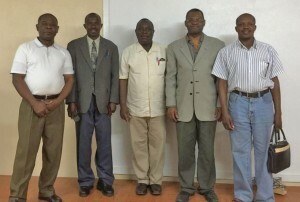 In the photo are: Dr. Henry Cher-Aime, Pastor Inadieu Tilme, Pastor Rolin Jean-Simon, Pastor Henry Claude Saintil, Pastor Simeon Prezandieu. Steps are being taken to form an alliance of Grace Brethren churches in the Bahamas. Last week, pastors Jesus Munoz, Javier Feraro, Henry Cher-Aime, and Dumont Cardichon traveled to Nassau to help the leadership organize the Bahamian congregations into a group. Pastor Henri and Pastor Dumont, who work with Caribbean Vision Ministries (Chuck Davis, executive director), are the church planters. Pastor Javier and Jesus, as well as a few pastors of the Florida District of Grace Brethren Churches, helped training the leaders of Bahamas and are guiding them in the organization process. More than 50 churches are invited to the September launch celebration, where the Grace Brethren movement will be introduced and documents for the Charis Alliance will be presented.